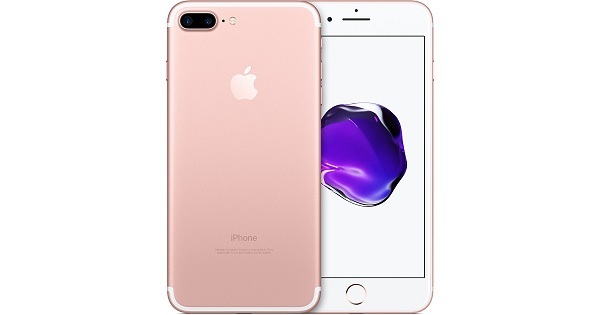 Apple iPhone 7 Plus smartphone. Announced 2016, September. All-new dual 12MP cameras. The brightest, most colorful iPhone display ever. The fastest performance and best battery life in an iPhone. Water and splash resistant. And stereo speakers. Every bit as powerful as it looks this is iPhone 7 Plus. The iPhone 7 Plus comes in 32GB, 128GB, and 256GB. Available in Silver, Gold, Rose Gold, Black, and Jet Black. You can recognize iPhone 7 Plus easily. iPhone 7 Plus doesn't have just one entirely new camera system-it has two. The same 12 MP wide-angle camera that's on iPhone 7 works with a 12 MP telephoto camera that can get even closer. That means you can get higher-quality zoom from farther away. And with an all-new depth-of-field effect (coming soon), portrait shots will look better than ever. The display on the iPhone 7 Plus is improved, now 25% brighter than the iPhone 6 Plus, with a wide colour gamut, colour management and the continuation of 3D Touch capabilities. With a 1080P resolution screen, iPhone 7 Plus is an amazing video player for watching movies and TV shows, which will bring you better visual video effect. M4V Converter Plus is a powerful iTunes to iPhone 7 Plus Converter. It provides the easiest way to convert iTunes movies to the formats iPhone 7 Plus support. You only need to drag and drop the iTunes video files to the program interface and then convert them to iPhone 7 Plus. It supports batch conversion, you are able to import several iTunes videos at same time. This program will convert them one by one. 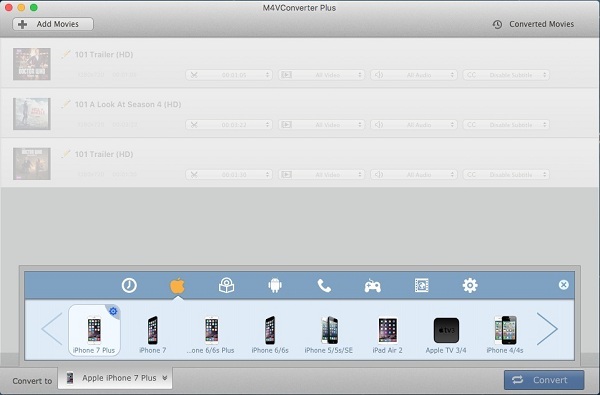 Here the main features of M4V Converter Plus for Mac. 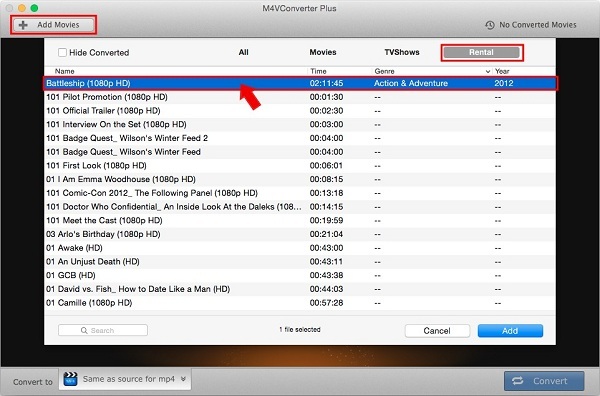 Convert iTunes movie purchases, Rentals, TV shows and music videos. Easily transfer converted files to iPhone 7 Plus, iPhone 7, iPad and Android devices. Step 1. Free Download and install the program. 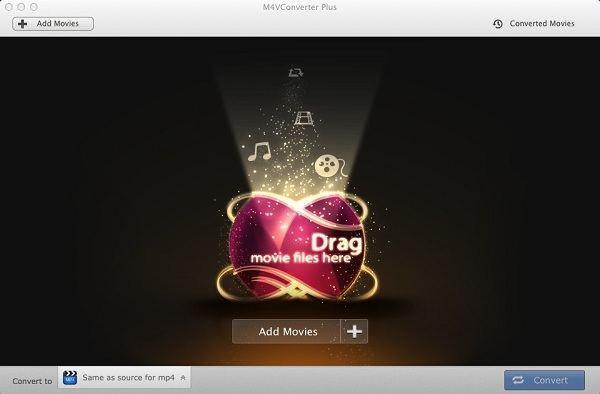 Click the above Download button to download M4V Converter Plus on your Mac, install and run it. It has a trial version that you can only convert one minute of each iTunes video. Step 2. Import iTunes movies to the program. You can click Add Movies button to add iTunes purchased or rented movies to the program. iTunes will automatically run together with the program. Please make sure you have the latest version of iTunes and sign in with your Apple ID. Step 3. Set output format for iPhone 7 Plus. Click Convert to profile drop-down list and set output format. You can choose MP4, MOV, AVI, WMV and other video or audio as output formats. You can also choose various players presets, including iPhone, iPad, Xbox, PS4, Android devices, etc. If you want to convert iTunes movies to iPhone 7 Plus, choose "Apple iPhone 7 Plus" from "Apple Device" option. Click Convert button at the bottom-right corner to start iTunes movies to iPhone 7 Plus conversion progress. Adopts a unique DRM decryption technique, M4V Converter Plus helps you to convert iTunes movies at amazing fast speed and maintain the original quality. Wait a moment, you can quickly find the files in Converted Movies option. Now you can transfer iTunes movies to your iPhone 7 Plus for playback freely.